Special introductory price exclusively on Amazon (for limited time only)! The InteVision knee pillow is designed to provide optimal spinal alignment to help reduce lower back, leg, hip, ankle, or joint pain. 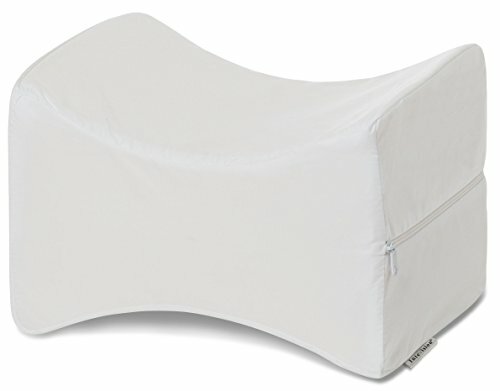 This carefully designed knee pillow can be used to place between the legs to keep your legs, hips, and spine parallel and aligned, helping to improve circulation and relieve pressure on those areas. The combination of memory foam top layer and the highly resilient base foam gives you the benefits you need: it feels soft, comfortable, and at the same time retains its shape well for its intended purpose. Includes a high quality, 400 thread count, 100% Egyptian cotton cover which can be removed for easy cleaning. GUARANTEE - If you are not 100% satisfied, just return it (even used) for a full refund. Two-layer-design: memory foam on top of a highly resilient base foam provides enhanced comfort while preventing the pillow being compressed into "flat". Includes a high quality, 400 thread count, 100% Egyptian cotton cover which can be removed for easy cleaning. Every product comes with the trademark InteVision. Size: 12" x 7" x 8"
GUARANTEE - If you are not 100% satisfied, just return it in 30 days for a full refund.